Summary: Ready, set, bake! Baking is fun, a great way to connect with kids, and the results are delicious. Whether you're slathering fluffy, white frosting over a decadent chocolate cake, or forming soft ropes of dough into creative shapes, time spent together in the kitchen creates memories that last a lifetime. Both young and old love a warm surprise when it comes out of the oven. Baking Kids Love brings the magic of baking alive through thirty delicious recipes, designed for 8 to 12-year-olds, that are totally a blast to make—and eat! Booking Daughter and I both loved BAKING KIDS LOVE by Cindy Mushet. It's just a fabulous cookbook for kids and parents alike; and it has already been named as a IACP 2010 Cookbook Award Finalist. There are truly so many great recipes in this cookbook that I had a hard time choosing which ones to try first! In addition to all of the delicious sounding recipes, this cookbook also had a lot of other things to offer. I loved all of the colorful pictures, and I thought the format was terrific. The cookbook is divided into six main chapters -- Let's Bake!, Cookies, Pies, Tarts, and Fruit Desserts, Quick Breads, Cakes, and Yeast Breads. There are also sections with Notes for Adults and Welcome to the Kitchen. I particularly enjoyed the Let's Bake section. It is absolutely perfect for beginning bakers because it explains everything you need to know about baking including how to line pans with parchment paper, how to measure ingredients, and how to check for doneness. Booking Daughter recently began taking Family & Consumer Sciences (otherwise known to us oldies as Home Ec); and I've recognized how little she knows about cooking. I am willing to take the blame because I haven't been the best mom as far as letting her help in the kitchen. This cookbook is a great start in the right direction for her. And that's exactly why I love BAKING KIDS LOVE so much. It's absolutely perfect for kids who are interested in baking! It has wonderful recipes as well as very detailed step-by-step instructions. In fact, I was a little intimidated with the length of the recipes until I realized how specific they were. I read through most of the recipes and I can't find even one little thing that was left out. Not only is it perfect for kids, but it is also perfect for beginning bakers -- whatever their age might be. So you're probably wondering what we decided to make first. Since we are hosting Mother-Daughter Book Club later today, we decided to try two recipes -- Secret Ingredient Chocolate Chip Cookies and Milk Chocolate Toffee Bars. Both were extremely easy to make and very, very good. I have to admit that my first batch (or two) of the cookies kind of didn't work. I loaded the cookie dough on as I normally do for chocolate chip cookies, but the dough was much thinner and spread way more than I was expecting during baking. I had big cookie blobs! I finally learned my lesson and made six cookies per sheet and they turned out perfectly. Booking Daughter said that they were the best cookie she's ever had -- and that's really saying something since she doesn't usually like oatmeal in her cookies. Oh yeah -- the secret ingredient is crushed corn flakes! Position an oven rack in the center of the oven, and preheat the oven to 350 degrees. Turn the pan upside down and mold a piece of aluminum foil to the outside. You should have about an inch of overhang around the edges. Slide the foil off the pan bottom , and turn the pan right side up. Slip the foil inside the pan. Fold down any foil that extends past the top edges over the outsides. Lightly butter the foil, or use pan spray. Put the flour, baking powder and salt in the medium bowl and whisk until blended. Add the dry ingredients to the butter mixture and beat on low speed just until no patches of flour are visible. Add the chocolate chips and toffee bits and continue to beat on low until they are evenly blended in the mixture. Using the spatula, scrape the dough into the prepared pan, and smooth the top in an even layer. Bake on 35 to 40 minutes, until the top is golden brown. Using the oven mitts, transfer the pan to a cooling rack and let cool completely. To remove the big bar from the pan, grasp the foil at the top in 2 places opposite each other and gently pull upward. Set the big bar on a cutting board, and gently peel off the foil. Using the chef's knife, and starting on one side, cut the square into 6 equal strips. Then cut 6 equal strips in the opposite direction. You will have 36 bars. Of course, you can cut the cookies larger or smaller, if you like. Store in an airtight container or a resealable plastic bag for up to 4 days. I really can't rave enough about BAKING KIDS LOVE. It's a fun and beautiful cookbook that would make the perfect gift for kids of all ages! Thanks to the publisher for sending me a copy of this adorable cookbook! 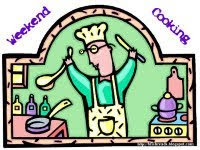 Weekend Cooking is hosted by Beth Fish Reads and is open to anyone who has any kind of food-related post to share: Book (novel, nonfiction) reviews, cookbook reviews, movie reviews, recipes, random thoughts, gadgets, fabulous quotations, photographs. If your post is even vaguely foodie, feel free to grab the button and link up anytime over the weekend. Please link to your specific post, not your blog's home page. For more information, see the welcome post. This looks like an absolute must have book whether you have kids or not. Wow. Great review, yummy recipe, and fun video. This book sounds wonderful!! Since we have a small family, I always appreciate recipes that makes small portions too - it's easy to double a recipe, but it's not always easy to cut one in half. I started baking with my kids when they were very young and they always loved it. This sounds like a great book. 2010 BBAW - Forgotten Books?